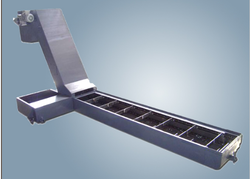 Unique Scraper Conveyors are suitable for handling fine chips of Cast Iron, Aluminum and Steel These Conveyors are of solid construction. The body with wear resistant design gives longer life. The chain is made of High Carbon Steel with Heat Treated material, moving on Sprockets with self aligning bearings for smooth operation. Magnetic Conveyors are very useful for removing chips from Hobbing Machines, Gum Drilling machines, Broaching Machines, Presses etc. The conveyor can be submerged in oil tanks. These are available in various sizes and configurations, as per customers specifications. 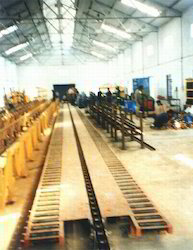 Srv manufactures slat conveyors for various applications. These equipments are specially designed for customer’s specific requirements. Based on the technical data given by the customer and a thorough study by our design experts the equipments are designed to achieve the desired results. Mag tools scraper conveyors are suitable for handling short powdered chips and sludges from the coolant effectively from high chips producing machines like SPMs etc.. Available in width 50 mm to 1500 mm width. Safety tripping arrangement is a standard features. FINE – Light and sharp chips generated from gear shaves, Gear Hobbers, Spline cutting machines, SPM’s deep hole drilling machines, broaching machines, Press shops and Heat treatment shops coming with large amount of coolant tend to escape with the coolant and cause damage to the pump and effects surface finish. This type of conveyors are suitable for handling short powdered chips and sludge from the coolant effectively from high chips producing machines like spms etc. Available in width 50 mm to 1500 mm. We are offering to our valued customers a wide assortment of 60 TPH Chain Conveyor. These chain conveyors for our customers are spread across the nation.